The village of Hippola is situated in a remote location some 15 kilometres east of the town of Kandy. Here some 980 people reside in 212 families. Most of the inhabitants of Hippola are labourers or farmers. The village is divided into two ‘halves’ separated by paddy fields. One half of the village has no water supply at all. One small stream on the other side of the paddy regularly and easily dries out in the heat of the sun and lack of rains for a substantial part of each year. 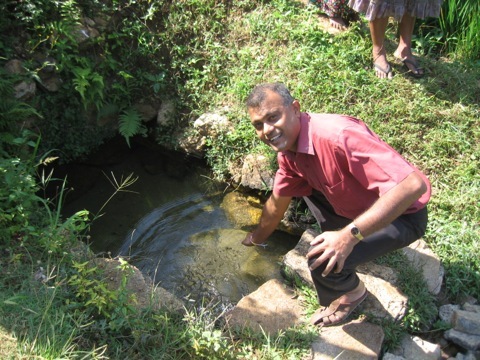 One of Project Sri Lanka’s main projects for 2013 is the provision of a well for this village that will provide a water source for drinking and bathing for the whole village and will also enable water to be pumped to the Temple. The well site is approached by a walk down into the paddy fields where the water source is located. From this place any visitor has magnificent views over the local agricultural environment and hillsides. The people of Hippola are both delighted and appreciative of the well which has transformed living conditions in both sections of the village.